This rare oil painting by John Skinner Prout most likely depicts Willoughby Falls near Sydney. The luxuriantly forested landscape is filled with native plants and animals, appealing to an English Romantic taste for exotica. An idealised, Arcadian view, it is removed from the reality of European settlement at this time and its detrimental effects on the Indigenous population. 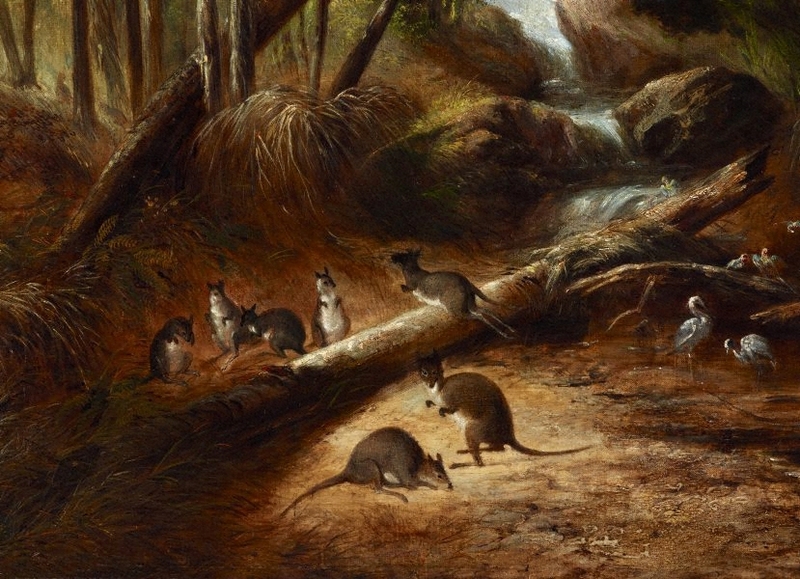 This painting was incorrectly recorded on several occasions as depicting a scene in Tasmania, where Prout worked between 1844 and 1848. 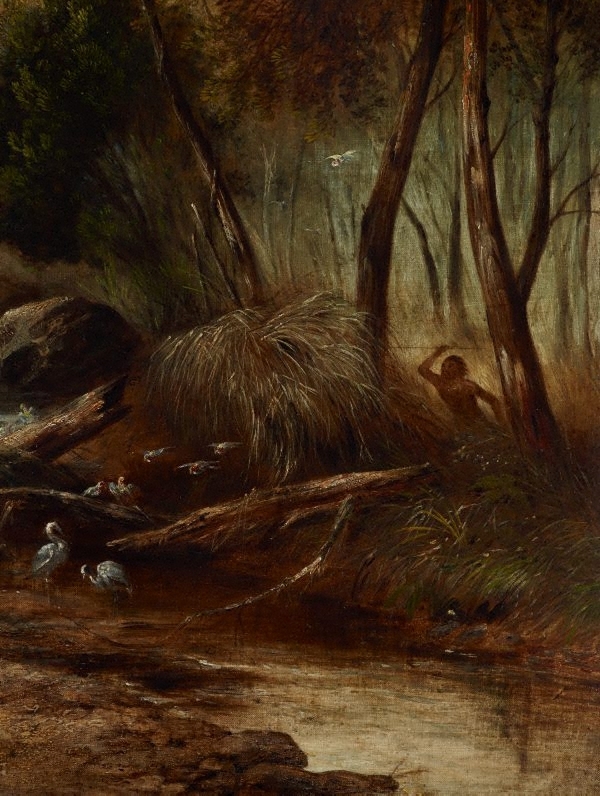 A close study of the flora and fauna in the painting, however, substantiates that it is a NSW setting. Christie's, Australia Pty. Ltd., Christie's Australia. Australian and International Painting. Melbourne 22 August 2000 , South Yarra, 2000, 102. lot no. 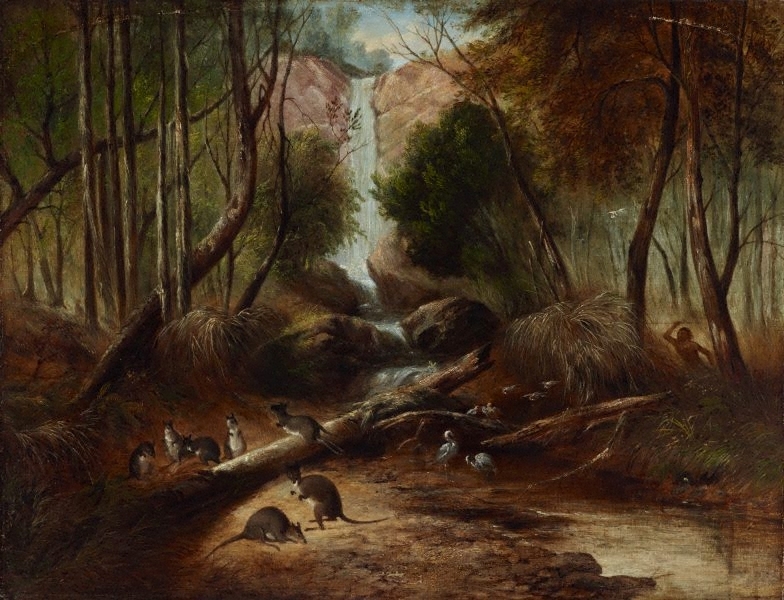 121 is a related work, 'Willoughby Falls, New South Wales', oil on canvas, 89.0 x 70.5cm, circa 1842. Barry Pearce, Art Gallery of New South Wales handbook , 'Australian', pg. 13-35, Sydney, 1988, 15. 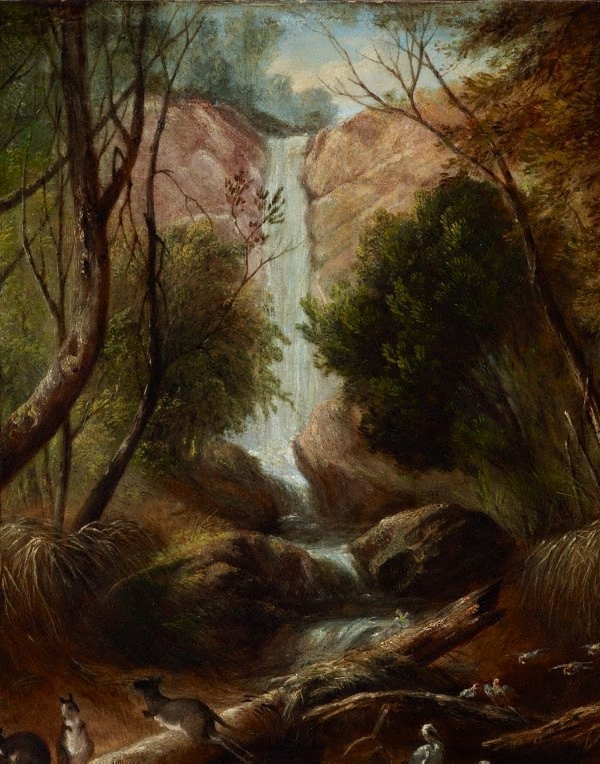 Ursula Prunster., Art Gallery of New South Wales collection series 2 , 'John Skinner Prout: Cascade Falls, Hobart', Sydney, 1982, cover (colour illus.). Sotheby's Australia, Sotheby's Melbourne: The Foster's collection of Australian art, 23 May 2005 , Armadale, 2005, 12. lot no. 3 is a related work, 'Aborigine stalking - Willoughby Falls, New South Wales', watercolour and gouache on paper, 66.5 x 90.5cm, circa 1945, reproduced on page 13. Unknown, Australia's Animals: who discovered them? , Sydney, 1978, cover (colour illus. ).